In the Hellenistic Testament of Abraham it is Adam, the representative of humanity, who sits at the gate of hell and paradise; the Jewish view of later times placed Abraham, the progenitor of Israel, in Adam's place. This was also the view of the New Testament writers as presented in Luke, xvi. 19-31, the story of Lazarus and the rich man. Lazarus, the beggar, died and was carried by the angels into Abraham's Bosom; the rich man died and was put into Gehenna, where he saw Lazarus in the Bosom of Abraham, full of joy, whereas he suffered great torment. Thereat he cried: "Father Abraham, have mercy on me!" and finally he asked Abraham to send Lazarus to his father's house to admonish his five brothers to lead lives characterized by repentance, in order not to meet the same fate as his own. Whereupon Abraham said: "They have the law of Moses and the teachings of the prophets; let them be mindful of these, and they will enter paradise as well as Lazarus." 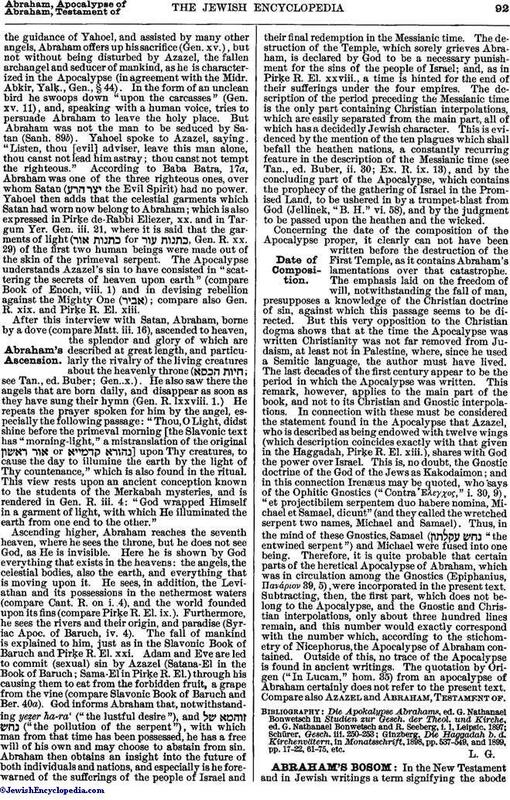 On Lazarus (Eliezer) and Abraham see Geiger's "Jüdische Zeitschrift für Wissenschaft und Leben," vii. 200. 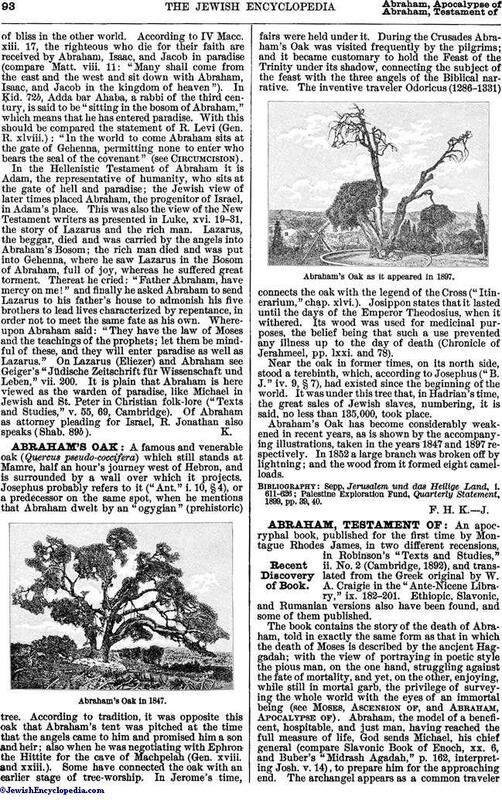 It is plain that Abraham is here viewed as the warden of paradise, like Michael in Jewish and St. Peter in Christian folk-lore ("Texts and Studies," v. 55, 69, Cambridge). Of Abraham as attorney pleading for Israel, R. Jonathan also speaks (Shab. 89b).